Margaret M. Madeleine, MPH, PhD, is a Research Associate Professor in the Department of Epidemiology in the School of Public Health at the University of Washington and an Associate Member of the Program in Epidemiology at the Fred Hutchinson Cancer Research Center. 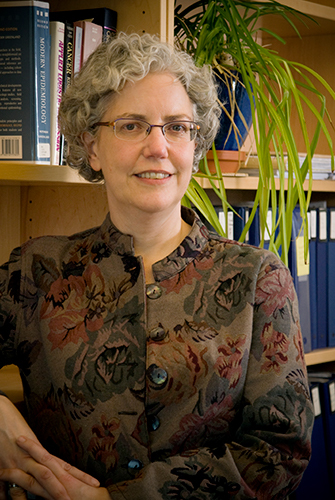 She received her MPH in Epidemiology from Yale in 1991 and PhD from the UW in 1996. She has been a key member of the Seattle HPV research group, and focuses on the epidemiology of HPV related cancers. Prior grants have focused on the role of inflammation and immune genetics in cancer. Current projects focus on the role of HPV vaccination in prevention of HSIL and uptake of HPV vaccination in Washington State. Dr. Madeleine’s research focuses on the epidemiology of infection-related cancer, especially HPV-related cancers and pre-cancerous lesions. She has led studies that examine the immunogenetics of HPV-related cervical and vulvar neoplasia, with a focus on HLA alleles, and continues to follow up on that work as a leader in the International Cervical Cancer Consortium. She recently completed a cohort study on Skin Cancer after Organ Transplant (the SCOT study), which examined the role of cutaneous HPV in non-melanoma skin cancer. She currently is leading an HPV vaccine trial (the VIVA study), to investigate whether the licensed HPV vaccine interrupts progression of high-grade neoplasia. Dr. Madeleine's major research focus is on the molecular epidemiology of pathogens and our immune response to them that may be associated with cancer development and prognosis. She is interested in the common drivers behind the role that chronic subclinical inflammation (such as occurs with age, viral infection, and UV exposure) plays in cancer. Her current work includes post-licensure trials of the HPV vaccine. Dr. Madeleine currently teaches EPI 524 "Cancer Epidemiology and Biology" offered annually in the Winter Quarter.